KATHMANDU, Feb 1: The National Medical Education Bill was endorsed by the National Assembly, the upper house of parliament, on Thursday, paving the way for its implementation. Amid protests from the main opposition party Nepali Congress (NC) demanding revisions to the bill to address the demands of medical education reform crusader Dr Govinda KC, the upper house endorsed the bill without any revision. 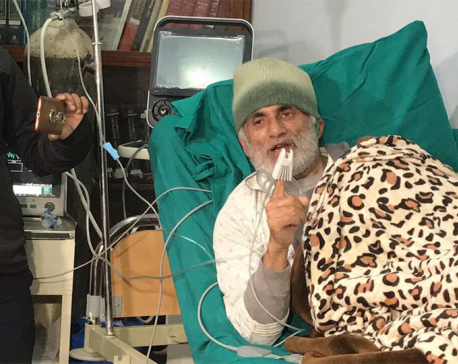 Dr KC has been staging a fast-unto-death for the last 23 days to protest the bill in its present form. The bill will come into effect after its authentication by President Bidya Bhandari. The controversial bill was endorsed by the lower house last week with the deployment of marshals against NC lawmakers protesting from the well. They are demanding that the agreement signed between the government and Dr KC be honored by the bill. NC lawmakers also obstructed the upper house meeting on Thursday, rising from their seats. But they didn't troop into the well as they used to do before. In a last ditch effort to revise the bill, lawmakers Radheshyam Adhikari, Sarita Prasain, Badri Pandey and Prakash Pantha registered two amendments, but the upper house rejected these through a majority. The National Assembly also rejected an amendment proposal from Rastriya Janata Party Nepal lawmaker Brikhesh Chandra Lal. He also demanded that the agreements with Dr KC should be incorporated in the bill. Tabling the bill for endorsement, Minister for Education, Science and Technology Girirajmani Pokharel claimed that it has addressed most of the concerns raised by Dr KC. “I want to assure you that the government is committed to saving Dr Govinda KC's life and it will remain open for talks and resolution of the problem even after the endorsement of this bill,” said Pokharel. The new legislation bars the opening of new medical colleges in Kathmandu Valley for the next 10 years and makes the recommendation of the Medical Education Commission mandatory for the affiliation to any new medical college outside the Valley. But in a breach of the agreement reached with Dr KC in July, the bill has paved the way for the affiliation to new medical colleges outside the Valley that have already receiving letters of intent . The minister informed that the bill has a progressive provision of converting all medical colleges into not-profits after 10 years. The new bill also has a mandatory provision for 75 percent scholarships in government owned medical colleges and for reservations . The main opposition NC also obstructed the lower house meeting on Thursday to protest the endorsement of the bill through use of force . NC lawmaker Minendra Rijal demanded revision of the bill, again drawing the attention of the government to the need for dialogue with Dr KC. 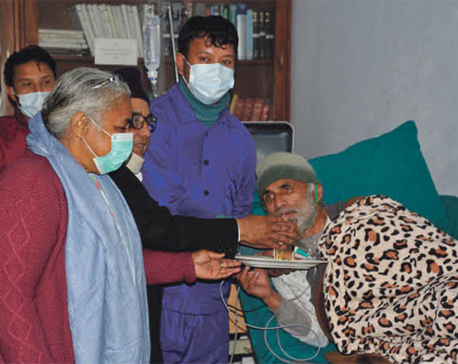 “Talks with Dr KC should be initiated and the bill revised to save his life,” Rijal insisted. After the NC obstruction the speaker adjourned the meeting for Sunday. Meanwhile, Minister for Communication and Information Technology Gokul Baskota, who is also the government spokesperson, argued that relevance of Dr KC's fast-unto-death had ended with the endorsement of the bill from parliament. Responding to questions by journalists about the government's plan for resolving the issue, Baskota suggested Dr KC end his fast and resume his duties. “Those inciting him should take responsibility for a safe landing for his protest because his agenda has become irrelevant following endorsement of the bill by parliament addressing almost all his demands,” he said.